Culture, talent and music come together like never before in this year’s production of The Dolphin Show: Ragtime. The Dolphin Show is the nation’s largest student-run musical, and is currently in its 76th year at Northwestern. Dolphin cast members pose after a rehearsal. The rehearsal process for Dolphin follows a noticeably more challenging schedule than other student productions. Actors began rehearsing in mid-November for three weeks, before taking a monthlong hiatus over winter break and returning just one week before beginning tech rehearsals. And with the massive scale of the production, the process has demanded the absolute best from the show’s actors. Luckily, the cast operates as a close community. Communication senior Alex Schneidman, a Dolphin Show veteran, finds himself surrounded by people who are passionate, determined and capable. Schneidman plays Tateh, a Jewish and Latvian immigrant coming to America as a single father hoping to create a better life for his daughter. He is the main character from one of three main communities featured in the show, along with the upper-class white Americans and the African American artists in Harlem. Taking place in 1906 in New York City, the show sees these once disparate communities thrust together in unanticipated ways as the new century dawns. The ways Ragtime explores the dynamics between different racial and economic societies are sure to ring true with audiences today. Communication senior Sarah Ohlson plays Mother, the head of the white, upper-class family featured in the show. She connects to Ragtime’s tendency to challenge its characters, and how true change only comes from unfamiliar situations. Ragtime is directed by Michael Herwitz, a Communication senior who has been with the production for nearly an entire year. Getting to direct The Dolphin Show marks the fulfillment of a journey that Herwitz began five years ago. He saw The Dolphin Show by coincidence during his junior year of high school when visiting campus. Ragtime was chosen to be the 2018 Dolphin Show in April of last year, long before rehearsals began. Herwitz says he and his team were well aware of the challenge that Ragtime would present, but were too eager to tell its story to pass it up. Many involved with Ragtime are working on a larger production than they ever have before. Herwitz recalls directing a show in Shanley Pavilion in his sophomore year with 15 actors, and notes just how dramatic the jump to a 36-actor team has been. However, “going big” was a major goal for this year’s production, with the creative team wanting to put on something big on every level, from music, to production, to the cast, to the emotions. “We wanted something that had a really big heart and a really big emotional core, and with a really big score that could fill Cahn Auditorium, so no matter where you were sitting you could feel connected to the characters and to the story,” Herwitz said. 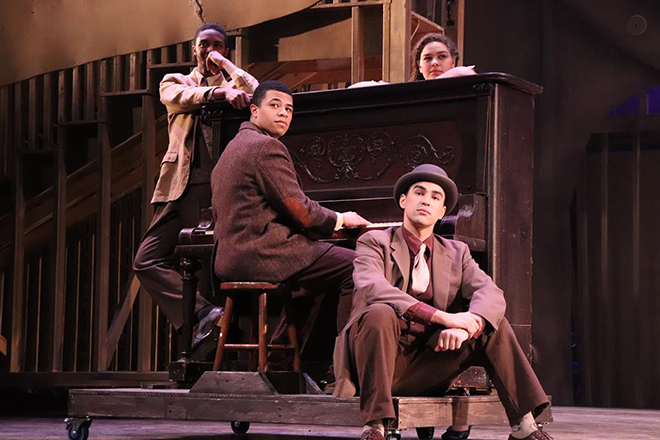 Those involved have made strong connections with the source material, and believe students will find the same connection with Ragtime’s powerful themes of justice, love and family.